Having conquered the art of making the perfect sourdough boule, Dave decided to get back to the first challenge he set himself: making the perfect baguette. He was sitting at the computer, grazing the various recipes on the internet, when a litany of "What? Sugar? Screw you!" and "Glaze? They put glaze their baguettes? Augh!" A similar stream of curses flowed when he was researching bagel recipes, especially those that called for milk to be added to the dough. Flour, water, salt and yeast—or sourdough starter—are, to him, pretty much all that is necessary for most breads. Time, too, is a key ingredient, and I'm constantly shuffling the contents of our refrigerator to make room for bowls of bread (or in this case, baking sheets of bagels) to sit overnight to develop their flavor. The recipe below is written in his own inimitable style, with instructions and notes. It was his second attempt at making bagels, the first batch somewhat lacking in proper bagel texture and that perfect round shape. This effort was much more rewarding and will probably serve as the basis for future bagel-y goodness. I'll keep you posted on how his baguette efforts turn out. Adapted from Peter Reinhart's The Bread Baker's Apprentice. In a mixing bowl, stir the yeast into the flour. Add the water and stir until you have a smooth batter, kind of like a thick pancake batter. Cover the bowl with plastic wrap. Let it rise for two or so hours at room temperature until it's almost doubled in size and is foamy and bubbly. Knead for 10 minutes. This is very stiff dough. Reinhart says the dough "should feel satiny and pliable but not be tacky." I just kneaded until my hands got tired and I got bored, about 10 minutes. Divide the dough into 4-1/2 ounce pieces. Roll the pieces into balls. Reinhart has a process for this. Cover the balls and let them rest about 20 minutes. Line two baking sheets with parchment and mist lightly with oil. (2) Poke a hole in the ball with your thumb and gradually stretch the hole to about 1 1/2 inches in diameter. I used the second method. In either case, the bagel should be fairly uniform in thickness. Put the shaped bagels 2 inches apart on the baking sheets, spray with a little oil, cover with plastic wrap and leave them at room temperature for about 20 minutes. After that time, drop one into a bowl of room-temperature water. If it floats within 10 seconds, it's ready to go into the refrigerator. If not, dry the test bagel off and put it back on the sheet and let the bagels rest for 10 minutes or so until one passes the float test. When a bagel passes the test, dry it off, put it back on the baking sheet and put the covered baking sheets into the refrigerator. The next day, heat the oven to 500 degrees and boil some water in a container wide enough to comfortably float three or four bagels at once. Add 1 tablespoon baking soda to the boiling water. Remove the baking sheets from the refrigerator. Gently drop three or four bagels into the boiling water for 1 minute. 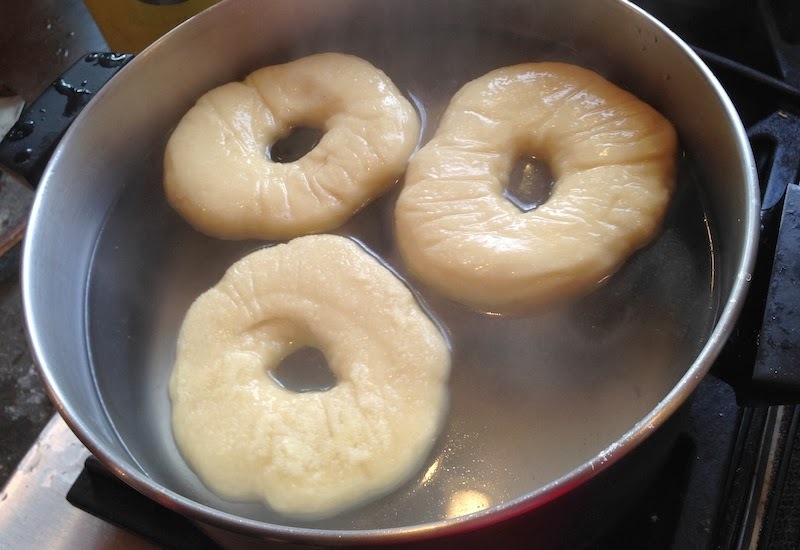 Flip the bagels to boil on the other side for 1 minute. While you're boiling the bagels, dust the parchment-lined baking sheets with the cornmeal or semolina. When the bagels have boiled, remove them with a slotted spoon and place them on the dusted baking sheets. Put the two baking sheets on two racks in the middle of the oven. Bake for five minutes. Swap each baking sheet to the other shelf. Rotate each baking sheet so what was in front is now in back. Lower the temperature to 450 and bake for another five minutes or until the bagels are light golden brown. Remove the bagels and cool them on a rack for 15 minutes before eating. 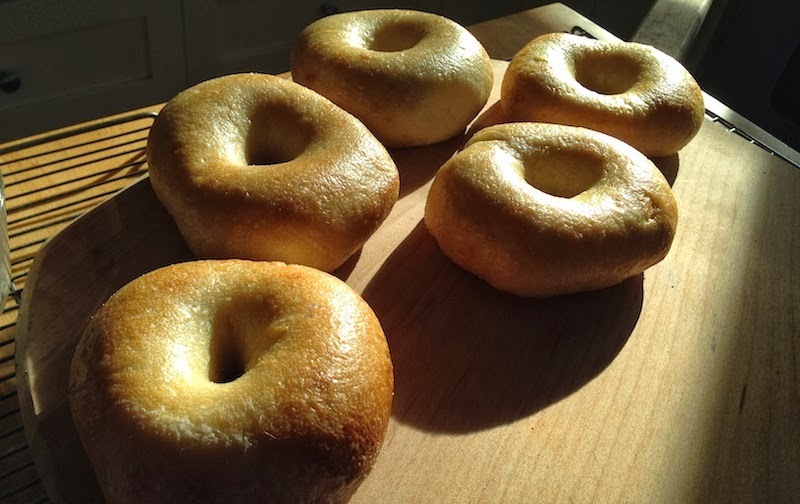 This method makes perfectly good bagels, but if you look at them from the side they are a little flat on the side that rested on the baking sheet. That's why there's a bagel board (Thanks, Elisha!). There are lots of websites that talk about these, but basically, they consist of a flat surface covered with burlap on one side. The bagel board is wet. The bagels are placed on it and put into the oven for a brief time, then are flipped onto a baking tile to finish baking. This allows the top side of the bagel to expand when first put into the oven, while the bottom side remains moist from the wet burlap. When the bagel is flipped, the side that was on the bottom now can expand and become rounded. I made three bagel boards out of Doug fir (websites call for cedar or pine), cut to 4 by 13 1/2 inches, just long enough to stick over the edge of the baking tile to make it easier to flip. I found some burlap at a local store and washed it--don't do this in a washing machine, because the stuff starts to fall apart. Also, some of the fibers seemed to stick to the bagel's surface. (Maybe there's special bagel burlap?) So I tacked a white cotton kitchen towel over the burlap, which seemed to work. Preheat the oven containing a baking tile to 500 degrees. Boil the bagels as above. Wet the bagel boards thoroughly. Place the bagels on the bagel boards. Place the bagel boards on the tile in the oven, leaving space on one end of the tile that is the width of a bagel board to allow room for flipping. Bake for three minutes. Flip the bagels from the first bagel board onto the tile and remove the bagel board. Flip the next board's bagels onto the space left by the first board, etc. until all the bagels are flipped and no bagel boards remain in the oven. Reduce the temperature to 450 degrees and bake another seven minutes or until the bagels are light golden brown. I am so tickled that he actually tried this and it worked! You're living my dream, Dave. Hopefully he'll make more and share some with you, Elisha!